Take The 7 Day Breakfast Challenge & WIN! 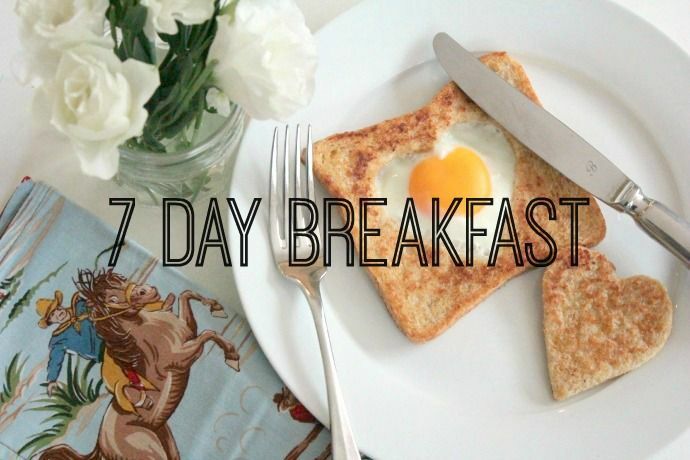 | Life Love and Hiccups: Take The 7 Day Breakfast Challenge & WIN! 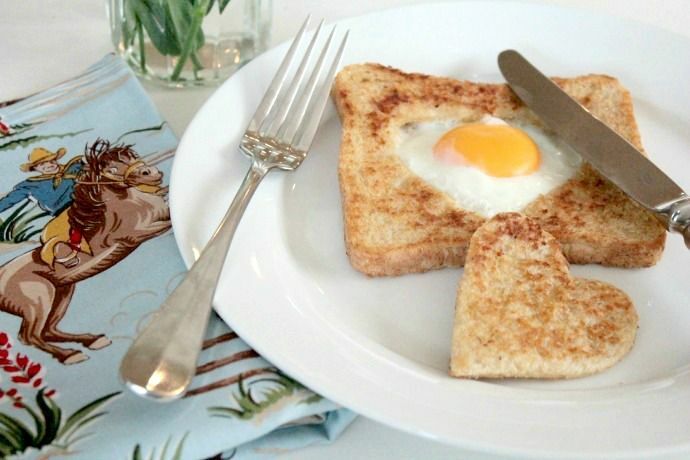 Did you know that on average us Aussies skip breakfast at least 77 times a year? It’s an issue with both the little people as well as us big people, although it is a bigger issue with adults. Research shows that around half of us adults skip breakfast at least once a week compared to one in seven kids. I hate to actually admit this but I probably miss having breakfast 5 mornings out of 7. As a mum I totally know the importance of my kids having breakfast before school and I have read loads of reports where skipping breakfast has been liked to poorer performance at school. It’s for this reason that every morning I force my boys to sit down and fill their bellies with something semi nutritious before they head off for the day. One of my little guys happily eats breakfast… in fact the first words out of his mouth are “Hi Mum, Hi Dad, Can I please have breakfast?” Keen as he is, clearly he likes his food. Weekends are different. Mornings aren’t so rushed and we can usually grab a little extra time before sports start to enjoy cooking up a little something extra together. Nothing that takes too long though, as we have neither the time nor the interest to be in the kitchen that long. It has to be something yummy that we are all keen to make and dig into. Like I needed any more convincing after reading that. 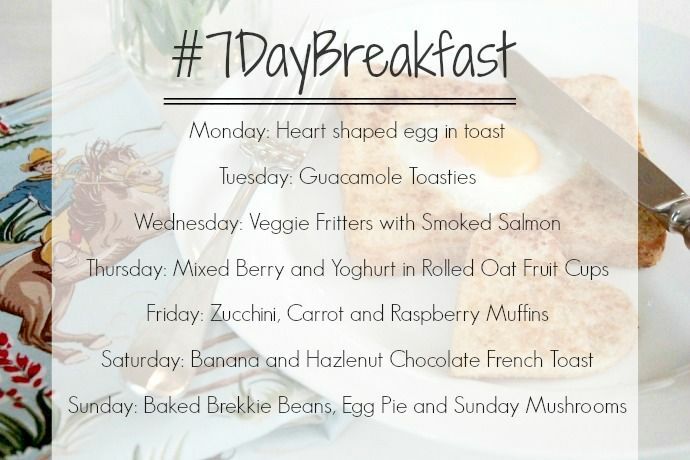 I made a promise to myself and to my family at the start of this year, that I would take better care of myself and so the deal was done, I was going to totally rock this 7 day Breakfast challenge. Better yet, I managed to get the whole family to agree to do this with me and now I am encouraging you to join us. I have scoured around for some yummy breakfast that take less than 15 minutes to make on a weekday and less than 20minutes on the weekend and here’s the menu I have come up with. So are you keen to give it a go with me? Come on, let’s do this together! I will be trialing all of the recipes this week and sharing our progress daily on Facebook and Instagram. At the end of this week, I’ll post all of the recipes for you in case you would like to try them for yourself and your family. Follow along on instagram here or Facebook here for some brekkie inspiration. 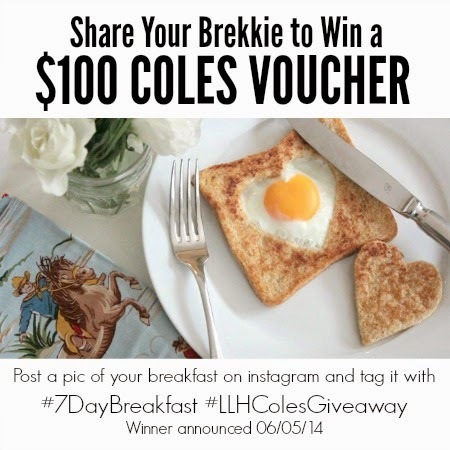 Take a photo of your own brekkie, tag it with #7DayBreakfast and #LLHColesGiveaway and share it on instagram for your chance to win a $100 Coles Voucher. If you are stuck for ideas for anything beyond your typical bowl of cereal, Coles have some fabulous breakfast recipes to get the taste buds working overtime. Check them out here and here. So day 1 is officially done and dusted and here’s today’s breakfast, which I have to tell you went down a treat with the boys. There was no begging required on my part and we all happily scoffed it up. In fact I'm already hungry for tomorrow’s brekkie. Are you a brekkie person? What do you make to tempt you to eat in the mornings?